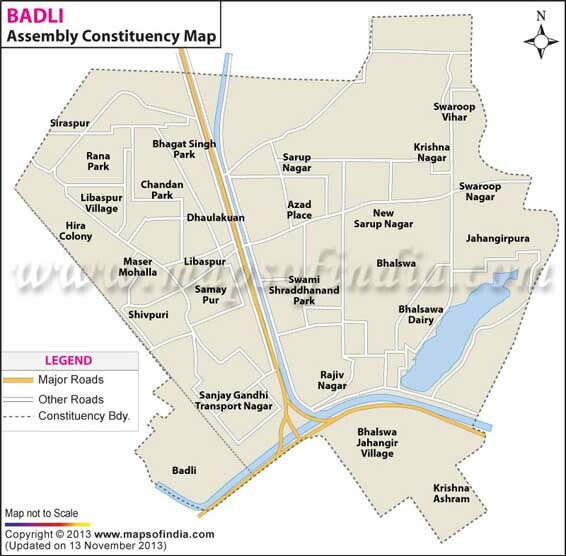 Badli Assembly constituency is a part of North West Delhi Lok Sabha constituency. 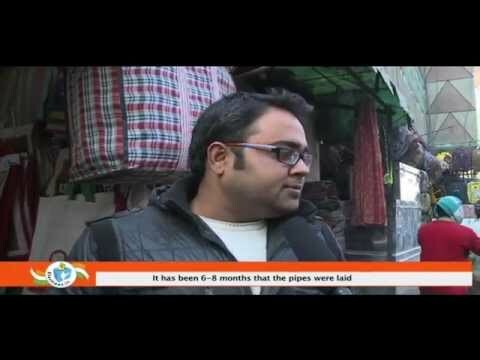 It is one of the oldest and biggest villages in Delhi. The constituency consists of two urban villages namely, Badli and Samaypur and three rural villages namely, Libaspur, Siraspur and Bhalswa. The Assembly constituency has an electorate of 2,00,994 . In the 2003 elections to Delhi Legislative Assembly, Jai Bhagwan Aggarwal of BJP made the hat-trick by winning the seat and defeating Dharm Vir Yadav of Congress. But in 2008 and 2013 elections, Congress managed to take away the seat from the BJP. Map showing the different localities of the Badli Assembly Constituency. Below is the list of winners and runners-up in the Badli assembly elections conducted so far. Swaroop Nagar. 1 - Gali No. -1, 2, 3, 4 Block-E , Swaroop Nagar, 2 - Gali No. -5 Block-E, Swaroop Nagar, 3 - Gali No. -6 Block-E, Swaroop Nagar, 4 - Gali No. -7 Block-E, Swaroop Nagar, 5 - Gali No. -8 Block-E , Swaroop Nagar, 6 - F- Block , Swaroop Nagar1 - Gali-1 G Block, Swaroop Nagar, 2 - Gali-2 G Block, Swaroop Nagar, 3 - Gali-3 G Block, Swaroop Nagar, 4 - Gali-4 G Block, Swaroop Nagar, 5 - Gali-5 G Block, Swaroop Nagar, 6 - Gali-6 G Block, Swaroop Nagar1 - Gali-7 G Block, Swaroop Nagar, 2 - Gali-8 G Block , Swaroop Nagar, 3 - Gali-9 G Block, Swaroop Nagar, 4 - Gali-10 G Block, Swaroop Nagar, 5 - Gali-11 G Block , Swaroop Nagar, 6 - Gali-12 G Block , Swaroop Nagar, 7 - Gali-13 G Block, Swaroop Nagar1 - Gali-1, 2 & 3 H Block Sindhi Colony, Swaroop Nagar, 2 - Gali-4 H Block Sindhi Colony, Swaroop Nagar, 3 - Gali-5 H Block Sindhi Colony , Swaroop Nagar, 4 - Gali-6 H Block Sindhi Colony , Swaroop Nagar, 5 - Gali-7 H Block Sindhi Colony, Swaroop Nagar, 6 - Gali-8 H Block Sindhi Colony , Swaroop Nagar1 - Gali-9 H Block Sindhi Colony , Swaroop Nagar, 2 - Gali-10 H Block Sindhi Colony , Swaroop Nagar, 3 - Gali-11 H Block Sindhi Colony , Swaroop Nagar, 4 - Gali-13, H- Block, Sindhi Colony, Swaroop Nagar1 - I-Block, Gali No.-1 , Swaroop Nagar, 2 - I-Block, Gali No.-2, Swaroop Nagar, 3 - I-Block, Gali No.-3, Swaroop Nagar, 4 - I-Block, Gali No.-4, Swaroop Nagar, 5 - I-Block, Gali No.-5, 6, Swaroop Nagar, 6 - I-Block, Gali No.-7, Swaroop Nagar, 7 - I-Block, Gali No.-8, Swaroop Nagar, 8 - I-Block, Gali No.-9, Swaroop Nagar1 - Block J, Swaroop Nagar1 - J Block , Swaroop Nagar, 2 - Gh (J) Block , Swaroop Nagar, 3 - Kh No J- Block, Swaroop Nagar1 - Gali No.-14, Swaroop Nagar, 2 - Gali No.-15, Swaroop Nagar1 - Gali No.-15, Swaroop Nagar, 2 - Gali No.-16 & 17, Swaroop Nagar1 - Gali No.-1, Swaroop Nagar Extn., 2 - Gali No.-2, Swaroop Nagar Extn., 3 - Gali No.-3, Swaroop Nagar Extn., 4 - Gali No.-4, Swaroop Nagar Extn., 5 - Gali No.-7 & 8, Swaroop Nagar Extn.